Tomahawks was from the beginning, constructed out of sharpened rock and bone. Today, they continue to be one of the best cutlery tools. The most prominent hawks are tactical tomahawks, known for their dependability and use in combat. Expectantly, from the time of the Native American to the Vietnam War soldiers have found tactical axes unexpendable. It is no surprise that this type of tool is sought after when preparing for battle or a camping trip. 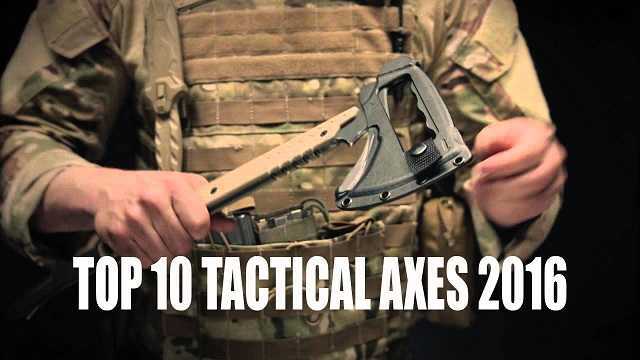 What are tactical axes? How were they used, and what are some of the best styles available? 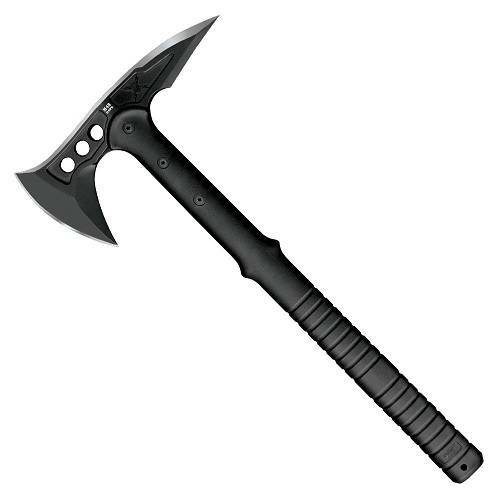 How is a tactical tomahawk different from a hatchet or an axe? Usually, a hatchet or an axe is not for military purposes. Axes are great for chopping, shaving, splitting and other chores. They are excellent as an edged tool. Typically, the grip is ergonomic in shape and allows for different hand positions. The axe or, the smaller version, the hatchet, is heavier to stabilise chopping. Overall, the axe and hatchet are created for one main thing, chopping, and these tools help to accomplish this task very well. Unlike the axe and hatchet, the tactical axe is considerably lighter. It is a better choice for combat and the straight handle allows for easy release while throwing. It can handle some chopping and bushcraft operations, but unlike a standard axe it is not built for this chore. Also, the Tomahawks have a long military history and tactical look to them. How useful are tactical tomahawks for military purposes? Is it a practical breaching tool? In quick emergency situations, tactical tomahawks can be used to breach windows and doors. Sometimes when there is a fortified door, there is not enough time to set up explosives. They are useful for breaking through glass objects and are small enough to get the job done in small quarters. Do soldiers use tactical axes for other reasons, besides breaching? If an edged tool can complete the task, a tomahawk can complete the same task: cutting rope, digging, splitting, chopping and prying. It will not be the best option for all the jobs listed above, but it will work with ease and efficiently perform multiple jobs. When did the tomahawk first become popular, and how has it evolved to suit the needs of soldiers? Tomahawks have existed since the 18th century and were used by both groups during the American Revolution. Also, they were utilised in the French and Indian war. During the Revolution, tactical tomahawks were valued because of their effectiveness as a weapon and versatility. After firearms had become more reliable, close-quarter weapons became less in demand. In the mid-1960s, the tactical tomahawks began to rise in popularity again. Over the last few years, tactical axes have become even more familiar not only with the military but also with the general population. The increased demand has occurred mainly because of the unique designs and current battle needs. The most significant revolution in Tomahawk history has been the transition from wooden handles to more advanced materials such as metals, composites and glass-reinforced nylon. 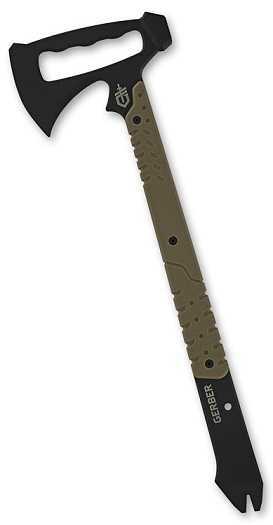 New technology or advanced materials have made the handle of the tactical axe stronger and lighter. Why would someone decide to throw a tomahawk? People throw tomahawks because it is fun. It is for recreation, but there are also competitions based on throwing axes, tomahawks and knives. The secret to accurately throwing a tomahawk is to find the right rotation. The thrower should look for the axe to rotate once, no more than twice. A three-time rotation is something that takes a lot of skill and strength. What are a few basic tips that military or civilians can use to keep them safe while working with a tactical axe? Treat the tactical axe like it is an extremely sharp knife. Always cut away from your body. Be aware of your surroundings. For instance, when chopping wood, or any other objects, make sure if you miss your target that it will not hurt you or anyone in the area. Be sure to wear high-quality protective material when cutting, such as eye protection and protective gloves. Until you are ready to use your tactical axe, keep it in the sheath. 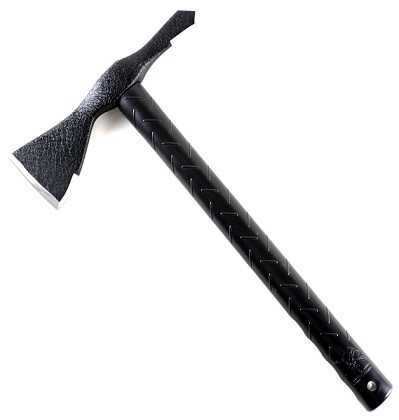 The LaGana Tactical Tomahawk (VTAC) has been battle proven for over 40 years, and it sets the standard for other axes. LaGana’s axe head design has been useful to the United States in every major conflict of the Vietnam War. The LaGana axe is modern with 21st-century materials and craftsmanship, and it sets the bar for versatility, toughness and ease of mobility. It is not unusual for military items to smoothly transition into tools used for survival in the wilderness. LaGana Tactical Tomahawk is an excellent example of this. It is highly recommended because it is a durable hand axe, good for survival. A survival tomahawk, like the LaGana or VTAC, is often used for cutting firewood, building shelters, self-defense, emergency aircraft extraction and other life-saving situations. Because of its exceptional durability, it can accomplish cutting tasks that might appear virtually impossible. Those who evaluate survival tools look for two of the most important traits: utility and durability. Exceptionally built, the LaGana Tactical Tomahawk has both. 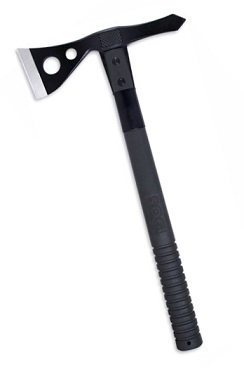 The LaGana Tactical Tomahawk Axe is made to last. It is military approved, made in the United States of America and comes fully equipped with a heavy-duty nylon sheath. The Booker Knives Tactical Plus Tomahook goes back to the time of the Vikings, Celts and Indians. Because of its versatility, it is a very functional tool. The Tomahook is an efficient hatchet because of its sharp and broad cutting edge. The upper part of the axe is sharp as a chisel. This Tomahook is a good choice for skinning animals and it’s also useful in emergency situations. It’s shaft is designed to engage securely and directing, thus enabling detailed cutting. Furthermore, it can be used as a hook, and the rounded point of the tool is useful for pounding or shattering glass. This is an incredible tool that is good for chopping, but because of it’s light head, it won’t be very good as a splitting axe. The conventional design allows it to perform certain jobs better than other tools. The thin head quickly chops through roots, branches and boards. The top edge is suitable for digging. The hook of the axe is a good option for prying open boards, and the repressed part of the shaft behind the hook can work as a knife. It’s unique Kydex sheath design covers the Tomahook for use in several types of cutting and working applications. It is 4.5 mm thick, 18 1/8 inches long, and 1.8 pounds. The length of the cutting edge is 5 5/8 inches. The recessed G-10 scales are extremely safe, comfortable and grippy. This tactical tool performs well with maximum versatility. It is crafted with an SK5 carbon steel band and covered with a corrosion-resistant coating. The SOG Double Headed Tomahawk has a cool antique look to it. It has outstanding durability and structure of a Tomahawk, but it has a heavier two edged head. SOG F12-N is large enough to exert a sufficient amount of power yet light enough to use with one hand. It is hard-cased with a black coating and a 420 stainless steel head. The F12-N’s 420 stainless steel head has two edges that are 3.25 inches. The black head is mounted with durable bolts and a steel ferrule to guarantee strength and stability. It is the incarnation of an unusual ancient weapon. 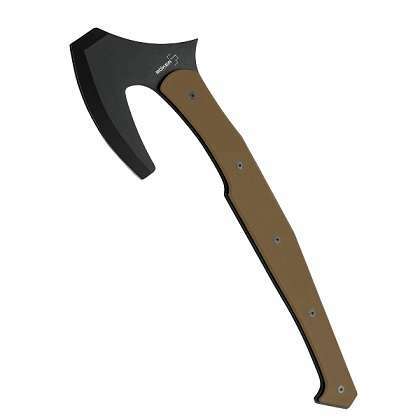 This axe can handle a variety of survival and tactical tasks making it ideal for hiking or camping. Even more, it offers a sturdy, practical construction and a firm polymer handle. The design is lightweight and ergonomic, making it comfortable to use. The axe has a precisely balanced head, allowing for accuracy when trying to hit a particular mark. The shaft’s handle is durable and slip-resistant and created with ballistic polymer. It weighs 31 ounces, yet it is incredibly sturdy and comfortable to carry. The nylon sheath comes with the axe for additional safety. The SOG Double Headed Tactical Axe has a lifetime warranty that protects against material and manufacturing defects. Ryan Johnson, the designer of RMJ Tactical, has refined his designed for more than 30 years. He had a loyal and dedicated following especially among troops. Now, his following has increased with his latest design of the Columbia River Kangee T-Hawk. This axe is strong enough to handle just about any job because it is craft from SK5 high carbon steel. The blade is efficient for shaving, splitting and chopping. Overall, this is a very sturdy shaft. The other end of the axe has an aggressive spike that can assist with smaller cutting tasks. Reportedly, the shaft feels good in the hand. The T-Hawk has a textured and finger choil grip with a curved handle for better control. The long handle has checkered scales adding enhancing overall grip control and security. Also, the checkered scales can be removed for easy cleaning. The T-Hawk balance right above the top lanyard tube at almost 0.25 inches thick. The sheath is Molle compatible and has a belt loop that is durable as a single retention strap. The Columbia River Kangee T-Hawk is of good quality, well-balanced and easy to control. The Estwing EBTA 27-Ounce Tomahawk Axe is an American made axe crafted for military and sportsmen professionals. The shaft comes equipped with Estwing’s Shock Reduction Grip, which increases durability, comfort and makes it suitable for carry. It’s design is impressively crafted for accurate cutting, excavation, trenching, digging, extractions and breaching. It is well balanced, weighted, forged out of authentic American steel and durable. The Estwing Shock Reduction Grip is bonded and reduces up to 70 percent vibration. The Reduction Grip will not come off. It comes with a black nylon sheath. The overall length is 16.15 inches. 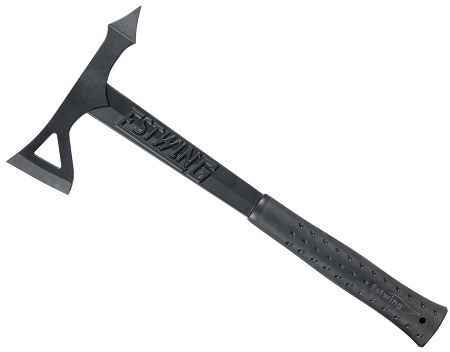 The Smith and Wesson SW671 Extraction and Evasion Tomahawk is a formidable extraction tool. It is two pounds and 11 ounces. It is made from 3/8 of an inch stock, and most of the axe is of the same thickness. The handle grips are removable and slightly texturized for a firm grip. The head comes with a snappable canvas that allows for easy removal. A belt loop is included, but belt carrying may not be practical. 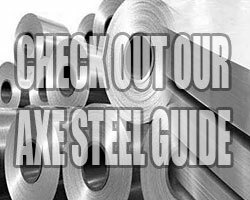 The SW671 is one slab of solid steel, making it practically indestructible. Also, it is made of 1070 high carbon steel, 8 mm thick. As a result, it is durable and offer edge retention. In comparison to 1055 carbon steel, this hatchet is better for chopping. The spike has a durable, hard edge, yet it is not as sharp as most Tomahawks. The weight of the axe is useful for chopping smaller logs. It can be used for various other tasks as well. Although it is not extremely sharp, it works well for busting concrete. It’s grip is Kraton, similar to a style used with SOG knives and blades. The handle allows for a two-handed grip because of the three ergonomic gripping sections. The Kraton slabs are removable for cleaning after removing the eight screws. Reportedly, wrapping the axe with a layer of 550 paracord provides a firm grip and ensures no shock transfer from the handle. Overall, this an incredible tool that feels like a hatchet but looks like a Tomahawk. Not only does it chop wood, but it also breaks concrete, bursts open doors, works as a climbing aid, can be used to dig a fire pit and is efficient as a fighting tool. The power from a single swing is known to destroy practically anything it hits. For those able to handle the weight of the Smith and Wesson SW671, this tactical axe is highly recommended. The Gerber Downrange Tomahawk aids in solving serious problems with astounding efficiency and simplicity. The tool is very stable with no parts to jam or break; likewise, there are no gimmicks or unnecessary parts to get in the way. It is one of the best well designed Gerber craftsmanship tools. The Downrange is capable of turning doors and walls into splinters and chopping through drywall. The back of the axe head works well as a hammer for working through tough locks, hinges, doorknobs or anything that might slow someone down. Also, it includes a pry bar at the bottom of the handle that is controlled by the cut-away grip in the axe head. At the end of the Gerber Downrange is a sturdy pry bar. With a solid combination of force and physics, one can fearlessly pry away using the cut-away-handle located in the axe head. I the pry bar will not break or bend because is crafted with a 420 HC steel body with Cerakote. Also, the G-10 handle’s integrated scales hold the tool firmly in hand in spite of any condition. The Tomahawks are not pocket tools, so it come with a practical sheath. No matter where you might be travelling, this is a tool is easy to carry. The sheath is compatible with MOLLE. It attached well to a backpack, body armour or standard webbing, so it comfortably goes where you go. This versatile tool is capable of handling a variety of tasks such as operations breaching, excavation, extraction and obstacle removal, which makes the SOG Specialty Knives & Tools F01TN-CP Tactical Tomahawk optimal for military personnel. The F01T-N Fusion is a 420 stainless steel head with a 2.75-inch edge. It comes equipped with a checkered side hammer for accuracy when pounding. The steel ferrule provides additional strength, and the handle is made of durable ballistic polymer. It has several material characteristics that meet military requirements and needs. The edge and head are coated with a black oxide coating to reduce reflectivity and coated in a scratch resistant substance. The head is mounted with durable bolts to a polymer handle, and the handle is designed to prevent splitting. A sharp blade does not guarantee precise cuts. If the axe does not fit comfortably in the hand, accurate cuts will be a challenge. The ergonomic handle takes care of this problem. The handle is durable, slip-free and well balanced. 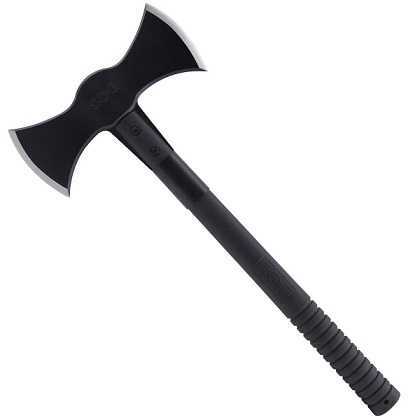 This axe has a beautiful black finish and weighs in at 24 ounces making this very light weight and carriable, and a nylon sheath is included for additional safety. It comes with a limited warranty against materials and manufacturing defects. 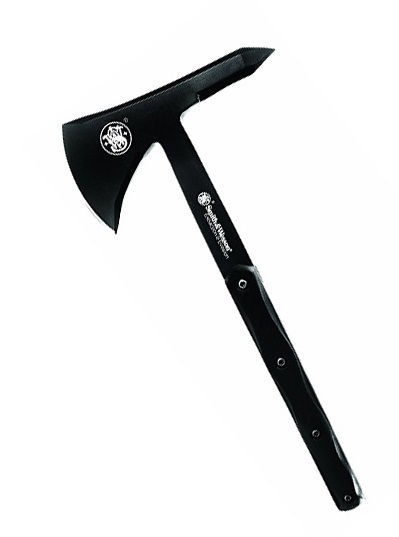 The United Cutlery UC2765 M48 Hawk Axe is a hatchet product from United Cutlery. This axe an excellent tool for sporting and hunting needs. The M48 Hawk is considered one of the ultimate tactical weapons on the market. It is lightweight and capable of being carried for long distances without fatigue. The M48 Hawk blade is broad and adapt for chopping, cutting, and slashing. The second edge is extremely sharp, and both sides work well for a hooking or cutting attack. The combined use of the axe and the spike makes this an efficient tool for self-defense and breaching. Also, the blade is indestructible and securely attached to a 30 percent, three bolt, reinforced handle. It’s shaft head is made of 2Cr13 stainless steel, and the tool comes with a nylon snap button sheath. The cutting edge length is eight inches by 15 inches, overall. 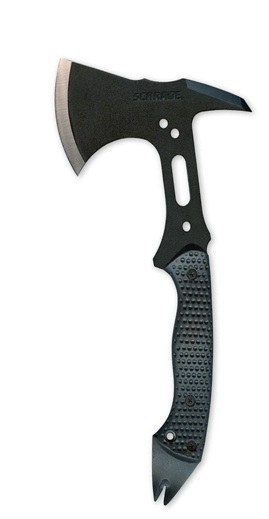 The Schrade SCAXE5 Full Tang Tactical Hatchet is an excellent tool to add to your emergency kit. 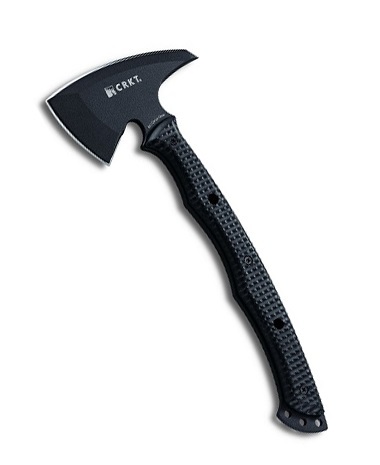 It can be used as a camp axe or for self-defense; however, it works better as a tactical entry and extraction tool. The tool is under 13 inches and slightly over 1.5 pounds. It is relatively light and fits comfortably into a backpack. The blade is over 3 inches and is created with SK5 high carbon stainless steel. The closed handle length is 6.4 inches. It includes a 1/4-inch black powder coated full tang with a pry or pull bar at the end of the handle. The blade is razor-sharp and does well with precision detail work. The handle is glass-filled nylon fiber with multiple grip spots and is correctly angled at the bottom for optimal leverage. While it is not intended to provide maximum comfort for avoiding stress or injury, the spike does a decent job with little effort. Unlike other shafts, the nail pull is very sharp and can do cause significant damage on its own. When camping it can easily be left on a low-lying piece of wood or the trunk of the tree. The sheath comes with button snaps. Which one is better, SOG F12-N or Estwing EBDBA Double Bit Axe? They are both great axes. F12-N has a polymer handle while Estwing is all steel. Hey have you done any research on the timahawk? Need to see if it’s worth wild in getting.